As any good Star Wars fan knows, on December 20th (USA), Star Wars the Old Republic will be released. 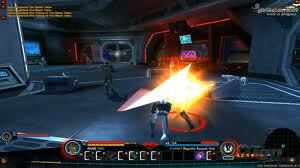 Lucas Arts, EA, and BioWare have once again teamed up to bring the Star Wars experience to the MMORPG generation. Now, this post may not have any new information for those who have been following The Old Republic since it was announced nearly a year ago, but hopefully this will be some insight into some of the features not many have gotten to experience. Unfortunately I have yet to be accepted into the beta test phase, but like several other games, I’ve had the opportunity to sit down for a couple hours behind a keyboard and have a little fun. As with any game, Star Wars: The Old Republic has the opportunity to be great or fall terribly short and be an utter disappointment. Star Wars fans, I can assure you, The Old Republic will meet all of your expectations and, hopefully, exceed many of them. Republic or Empire, the choice is now yours. While I could sit here and tell you about the gameplay of The Old Republic, I think it would be a waste of time. As far as general gameplay goes, if you have played an MMO and have played any of the Knights of the Old Republic games, you will know exactly what to expect from this game. Lucas Arts, like many other new generation MMO developers, has wisely decided that there is no point in changing the basic user interface layout, as its simplicity is now nearly universal in almost every game of this genre. Also, much like Knights of the Old Republic, you have the opportunity to have dialogue with nearly all of the NPCs you encounter. Lucas Arts has even taken this a step further, using over 1,000 voice actors for individual NPCs within the game so that every time you encounter something new, you aren’t hearing something you’ve heard before. Now, for what this post is really about. The Old Republic has brought some interesting aspects to PvP. Again, while you won’t necessarily be seing anything new, as an MMO is an MMO is an MMO, Lucas Arts has put a nice little twist on their PvP events. Lucas Arts has brought a new game to the table, introducing Huttball. From what you can see, Huttball can get pretty chaotic. With a somewhat large course layout, this 10 vs 10 match can be time consuming. One interesting feature of Huttball is that since the arena is in a neutral area, this PvP Warfront is not simply Empire vs Republic. There is a good chance that you could be facing off against your own faction in a competition to see who the best of the best are. The object of Huttball is to take the Huttball from the center of the arena across the opponent’s goal line, sort of like football. The Huttball can be carried or passed to players to achieve this. However, watch where you throw, as the huttball CAN be intercepted. Not only can the huttball be intercepted, if you are killed by an enemy player, the opposing team automatically gains possession of the huttball. Of course, this wouldn’t be a fair game without obstacles to get in your way. 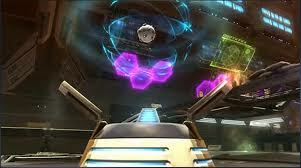 The huttball course consists of three levels. The lower level is where the huttball starts out at the beginning of the match and after a goal is scored and this level also contains two large pits of acid to back your opponents into. The second tier is where you will find your goal line and the opponent’s goal line, on the respective sides, just below the player spawn points. Finally the Third tier allows a player to move from goal to goal with considerable speed IF they can avoid the fire traps that are spread throught the walkway. As I said before, this is a unique take on PvP, not only with the actual Warfront concept of Huttball, but with the added concept of same faction competition. Emipre or Republic, whatever side you choose, I hope to see you on the Huttball course in December!